Georg Kaser studied meteorology and geography at the LFU Innsbruck. After his doctoral thesis in 1984 about "The Evaporation of Snow and Ice" he started his career as an assistant professor. 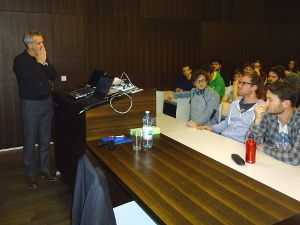 He habilitated on the topic "Glaciers in the Tropics" and got a position as an associated professor at the LFU Innsbruck. In 2010 he was promoted to full professor for climate and cryospheric research at the Institute of Atmospheric and Cryospheric Sciences. Since 2013 he has been member of the Academic Senate of the LFU Innsbruck and since December 1st 2015 he has been Dean of the Faculty of Geo- and Atmospheric Sciences. Georg Kaser was born in South Tyrol but he makes himself at home all over the world. In fact, he not only organised and coordinated research expeditions or training courses in the Alps but also in East Africa, Peru, Bolivia, India and Nepal. Moreover, he holds important positions in international scientific organisations as the IACS (International Association of Cryospheric Sciences) or as double lead author at the Intergovernmental Panel on Climate Change (IPCC), which was awarded the Nobel Peace Prize in 2007 together with Al Gore. After participations at the UN climate negotiations in 2013 and 2014 Kaser took part at the recent conference in Paris (COP21). 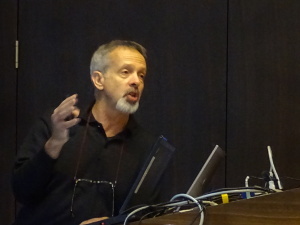 Prof. Kaser is regarded as one of the most important researchers on climate change. 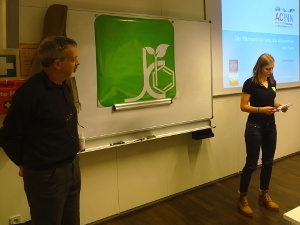 A large audience was present at the Jungchemiker lecture about climate change in the Center for Chemistry and Biomedicine on January 20th 2016. Many young and also several experienced chemists followed curiously Prof. Georg Kaser's reports about the climate conference in Paris, which had been held in December 2015 and had ended with unexpected results. Hardly anybody had anticipated the much more definite statements compared to the previous conferences to tackle climate change. Prof. Kaser demonstrated convincingly that global warming is happening by showing multiple experimental results and consistent model calculations. The future will show whether the measures stated in the conference's final report will be implemented. This would be strongly necessary as the current models draw a pessimistic picture for the world's climate. As food for thought about the role of the (in this case us-american) media in the topic of climate change Prof. Kaser suggests watching this YouTube video.